Ever get those dreams where you’re running, but no matter how fast you run you never seem to get anywhere? That’s what the last week’s knitting has felt like. There’s a couple of reasons for this. First of all, a cold which has left me feeling tired(er) and stupid(er). And secondly, the underarm gussets. Ah, gussets – one of the defining characteristics of the true gansey. It’s always good to reach the gussets, they’re sort of a milestone, a halfway marker like a 40th birthday. The only problem is, like reaching 40, everything starts to take longer (and you find yourself thinking about getting a pension because The End is that little bit nearer…). 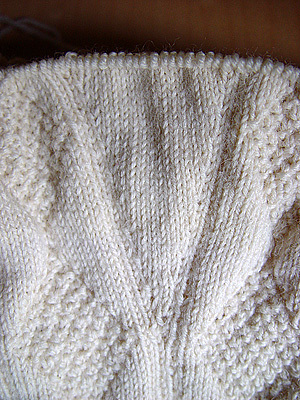 By the end of the week they gussets have increased to 19 stitches wide – but when you think about it, that’s a whole extra 38 stitches per row. So each row can now take as long as 40 minutes if there’s something good on television, like England thrashing South Africa at one-day cricket. Hence the feeling of running to stand still. The good news is, now they’re almost halfway, they look much neater than when I started them. 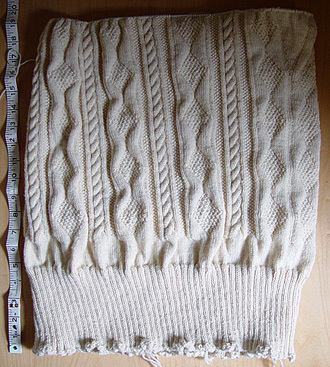 I guess this is mostly because your eye is drawn away from the untidy increases along the edges to the regular rows of knit stitches in the centre (and they’ll look even better once the finished pullover’s been washed and blocked). The body is getting pretty long – nearly 18 inches. 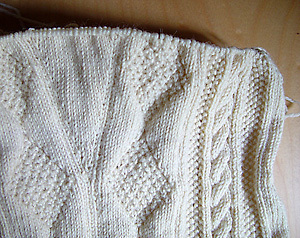 So next week, time to divide front and back, and say goodbye to knitting in the round for a while.